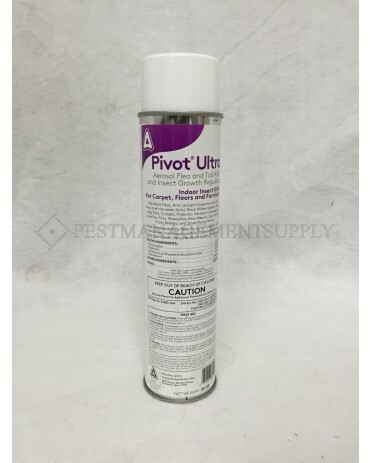 Pivot Ultra is an aerosol flea killer and insect growthregulator. Pyriproxyfen will break the insect pests' life cycle.The insecticide controls and eliminates adult fleas and also helpsprevent flea infestations for up to 7 months. It is also effectiveto use against ants (except Carpenter, Fire and Harvester), browndog ticks, black widow spiders, fleas, fire-brats, Germancockroaches, mosquitoes, lone star ticks, saw toothed grainbeetles, rice weevils, small flying moths and more. This aerosolspray insecticide can effectively treat up to 2,625 square feet offloors, carpet and furniture. The product is best used inhospitals, apartments, hotels, homes, motels, schools, offices,warehouses, veterinary clinics, utility areas, kennels and otherindustrial and commercial buildings. Quick drying. UV stable. Thisaerosol can be sprayed upside down. 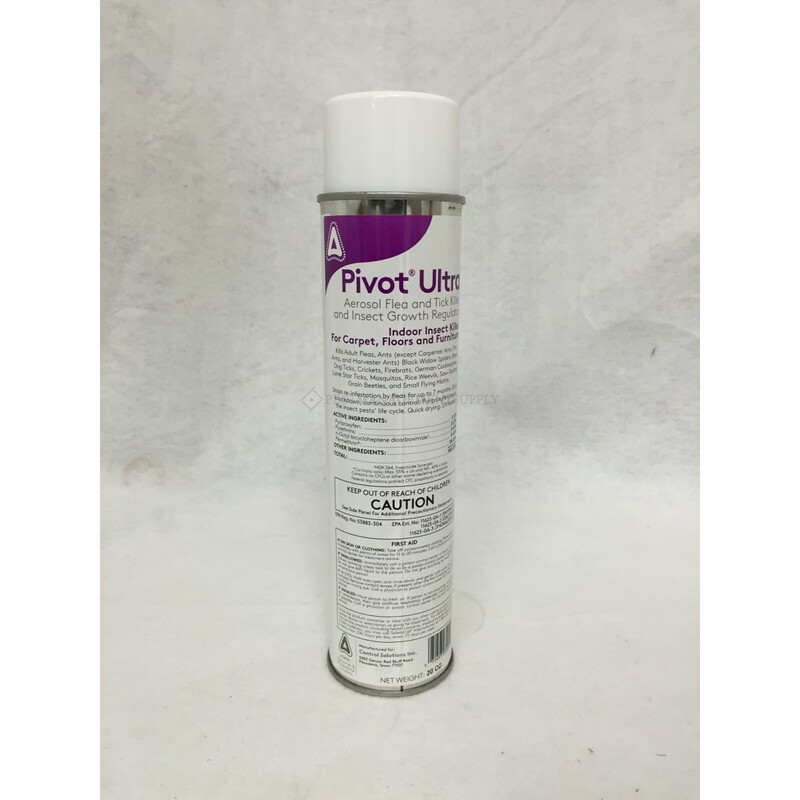 Product comes in a 20 oz. can and is for indoorresidential/non-residential use only. Yield 20 oz. can treat up to 2,625 sq. ft.
Do not contaminate food of feed stuff. This product is for indoor residential/ non-residential use only. Remove pets, birds and cover fish aquariums before use. Do not wet articles to the point of run-off or drip. Do not enter or allow others to enter the treated areas until sprays have dried. Do not enter or allow others to enter the treated areas until vapors, mists and aerosols have dispersed and the treated area has been thoroughly ventilated. Do not apply this product in a way that will contact workers or other person, either directly or through drift. Only protected handlers may be in the treated area during application. Do not remain in treated area. Exit area immediately and remain outside the treated area until aerosols, vapors and/or mists have dispersed. Do not use in food areas of food handling establishments, restaurants or other areas where food is commercially prepared or processed. Do not use in serving areas while food is exposed or facility is in operation. In the home, all food processing surfaces and utensils should be covered during treatment or thoroughly washed before use. Exposed food should be covered or removed. Application of this product is prohibited directly into sewers or drains, or to any area like a gutter where drainage to storm sewers, storm drains, water bodies or aquatic habitat can occur. Do not allow this product to enter any drain during or after application. NOTICE: This product has been tested on several types of carpet, fabric and other household furnishings without adverse effects. Test in an inconspicuous area before full treatment, some plastics or furniture may be whitened or dulled. Because of the wide variety of floor types and finishes always test for color fastness, or dulling before applying to larger areas. Avoid contact with antique finishes. For best results always follow complete application directions. A 20 oz. can treats up to 2,625 sq. ft. Vacuum carpeted areas and other areas being treated before treatment and post treatment after drying. Hold can at arm’s length and direct spray toward the area to be treated. Use a sweeping motion to apply product and back away from treated area while holding the can 36 inches away from the area being treated. An area of 100 sq. ft. (10 ft. x 10 ft.) can be treated by spraying across the area for 10 seconds. Vacate treated areas during application up until the spray has dried. • To Kill Adult Fleas, Brown Dog Ticks and Lone Star Ticks: Remove old companion animal (pet) bedding and replace with fresh, clean bedding after treatment. • Treat pets directly with an appropriately registered product labeled for such a use in conjunction with this treatment. • Do not apply this product directly to companion animals (pets).